What ski am I supposed to test next again? The top ski manufacturers from around the world met us in Aspen with skis in tow. All in all, the ski companies brought over 130 pairs of skis for us to test in the following categories: All-Mountain, Frontside and Powder. We employed over a dozen male and female athletes from Aspen to help us test skis throughout the week. 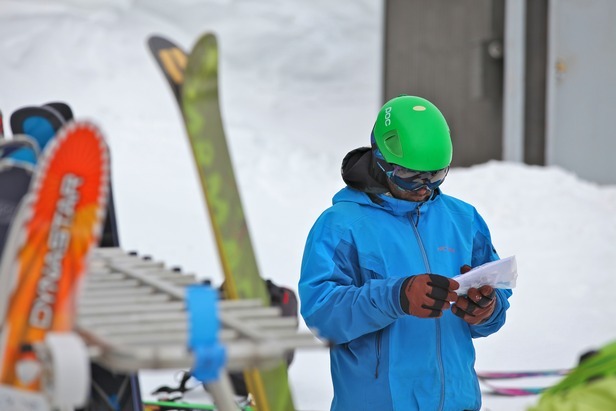 These locals ranged from former World Cup team members to ski instructors to mountaineers, ensuring we had a diverse array of testers that would ultimately represent the diversity of our skiing reader. We set up our headquarters for the week atop of Aspen Mountain (Ajax) just below the gondola terminal. This home base was where all of the skis lived, where most test cards were completed and where our testers refueled and adjusted bindings before going out on a new pair of boards. We had two binding technicians on call atop of Ajax that took care of adjusting the bindings to each skier's boot length and preferred DIN setting. After a skier's bindings were set, they were off to try the ski in a variety of conditions, turn lengths and terrain. Depending on the category of ski, a tester might decide to take that particular pair of boards on a mogul run, into some chop or just cruise it down Aspen's open corduroy highways. The Aspen Ski Patrol even opened up some untouched terrain for us to test powder skis in on the second day of the test. Each tester picked a handful of preferred runs that enabled them to get a good feel for the ski while also being able to get back to the top of Ajax relatively quickly to test another pair. After one run (and sometimes more) the tester would fill out a test card, scoring the ski on a scale of one to five on things like carvability, forgiveness and playfullness. The test cards also allowed testers to provide detailed info under their rating to give more context of how they determined the ski's scores. After completing a card, it was off to another pair of skis. Our testers were averaging somewhere between 15 and 25 skis tested per day—again, it's a hard job, but someone had to do it. At the end of the week, each test card was collected and those ratings and comments are the basis for what goes into our 2012/2013 Buyers' Guide. Over the summer, the numbers are crunched, the Editors' Picks are selected and the reviews are written. It's a long process that's a ton of fun during the test, a bit tedious throughout the summer and incredibly informative for the OTS reader in the fall when they're trying to determine what ski to buy.